Dominance. Hunger. Thirst. Signs of Affection. Could all of the above reasons be why your dog is a nibbler? Dogs have different reasons for nibbling their owners, including displaying dominance or to inform you that they’re hungry, thirsty, or even to show affection. Nibbling and mouthing is an action the dog will characteristically cling to because it mirrors their ancient instincts of the wolf pack structure and is a method of asserting dominance and showing affection. But beware, if you’re not readily available for a nibble, your scent on your shoes or socks may be an odor your dog simply cannot ignore! Nibbling isn’t necessarily a bad thing. All dogs nibble as pups. It’s natural and the manner in which they communicate. But nibbling should be kept in check or it could turn into a bad habit when the pup grows into a dog! For these reasons it’s important to have your dog socialized early on in their puppy years. Playing with littermates for instance will aid a pup in learning how to associate biting with pain. 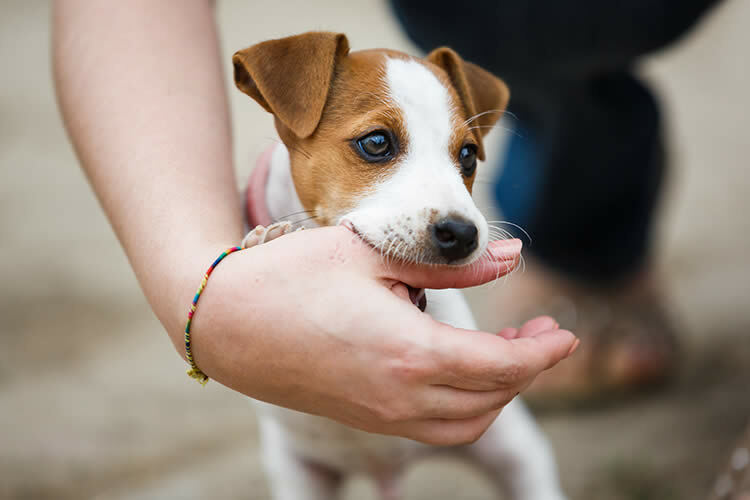 Only through associating with littermates can a pup learn bite inhibition or how to adjust its bite from a painful bite to one that will get the desired attention from its target (hence, the nibble). Dominating a litter mate would mean the pup would increase its bite pressure. If the puppy doesn’t learn early on the mechanics of bite inhibition you can count on problems in the future. Our dog, Angel, was a rescue from the shelter and he was a snapper. He bit our hands constantly until we enrolled him in an obedience class. There he snapped at a German Shepherd who nipped him and that cured him of his daily bites and nips. This was proof to me that bite inhibition does, indeed work! You may think nibbling is just a behavior to be ignored in pups but this is far from the truth. You may not think so but your pup is attempting to show its dominance over you, the owner, by nibbling. Just like the leader of the wolf pack, your pup is looking to you for leadership (dogs still do exist in a pack hierarchy). If you tolerate the nibbling, your pup may continue by increasing its bite level and thus demonstrate its dominance. Not correcting this behavior may increase your dog’s nibbling problem or even worse – your pup may bite you as it matures! This is definitely a behavior you don’t want to continue! Set the Rules and Think Like a Dog! Remember, you set the rules, not your dog! You must set the boundaries and limitations for your dog to become consistent. From the beginning of each nibble you should be saying, “No!” Then emit a loud yelp as if you were another puppy being bitten. Turn your back and ignore your pup for about 30 seconds. Wait until your pup is calm before you resume playtime. Make certain everyone playing with your pup acts out this same routine if bitten. This is how his mum and other pup-mates would react to teach the puppy right from wrong, so being consistent is the key here until your dog knows that difference! Another way to curtail the nibble is the introduction of new toys at playtime. In this way your dog can have an appropriate outlet with a toy instead of you. Lots of praise and attention should be given to your dog when he’s nibbling his toys so he can make the positive association between his actions and the toy (which, instead of your hand, is now the target object). Reference.com: What Does It Mean When Dogs Nibble Their Owners? Dogster.com: Why Does My Dog Nibble Us Like He Is Eating Corn on the Cobb?